Chicago is known for a couple of key items - the lovable losing Cubs, the windy city (named for it's politics, not the weather) and deep dish pizza. What most people don't realize is that there is a Chicago thin crust as well. Shocking, I know, but true! And I have to admit that I prefer a thin crust over a the thick deep dish. I find that after one slice of the deep dish (and who can stop at just one slice?) I am just soo full it is uncomfortable... and don't forget lethargic. With the weather forecast dipping below the single digits, what better way to pass the time stranded indoors than make a Chicago thin crust pizza!? Well, my version, anyway. Getting the dough right is the base for any pizza. I created an absolutely fabulous recipe for a flat bread pizza, much thinner and crispier than a thin crust, (and its cooked on a grill), but that's not what we need here. Second, we need to make a spicy, slightly sweet sauce. From there, it's all a matter of personal preference for the topping. 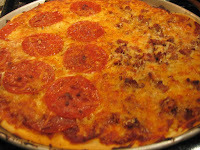 Below is the recipes for my thin crust as well as photos to show the steps. Choose a mixing bowl that will ultimately hold all the ingredients. Stir the yeast into the lukewarm water. Let stand about 10 minutes. Stir in the olive oil and the cold water, and then whisk in 1/2 cup of the flour and the salt, stirring until smooth. Using a wooden spoon, stir in the remaining flour, 1/2 cup at a time, until the dough comes together in a rough mass. 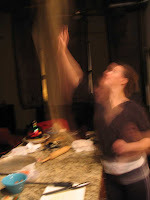 On a lightly floured work surface, knead the dough until smooth and velvety, 8-10 minutes. It will be soft. Cover loosely with a kitchen towel and let rest for 15 minutes. Divide into 2 equal portions, knead briefly, then roll each portion into a smooth, tight round ball. To use the dough immediately, sprinkle a little flour on the work surface and set the balls on it. 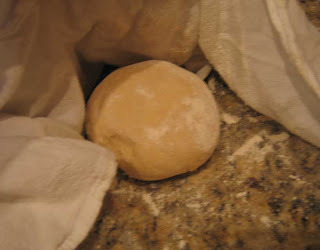 Cover them with a kitchen towel and let rise for 1 hour, then stretch and top the dough as directed in each recipe. I froze half of the dough to use another time. Simply wrap tightly in syran wrap and then in a freezer bag. Use within a month. 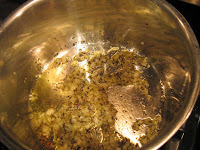 Sautee the onion in a little olive oil, adding the garlic and spices a few minutes later, until soft and translucent. Be careful here not the let the spices burn. You want these to just dissolve into the sauce! Add the remaining ingredients to the pan and simmer over medium heat about 10 minutes. 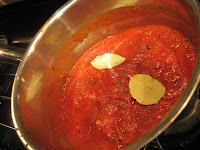 I have found I prefer this sauce without the bay leaf, as it tends to taste a bit more spaghetti’ish when using it. I believe less cooking time keeps this from turning too thick as well. 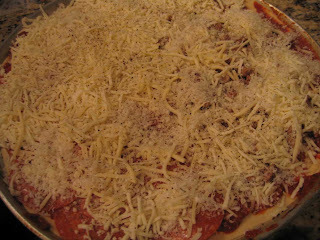 This recipe will yield enough for three or four pizza’s, so plan to freeze part of this as well. Now spread out your dough, you may need to use a rolling pin here – or try to master the ‘toss and spin’ for the authentic experience! It is best to have cornmeal here for a lay er on the pan to keep the bottom of the crust slightly crispier. Lay your dough on the pan and top with your ingredients. We did half pepperoni and half sausage with some caramelized onions and garlic, mozzarella and Parmesan cheese and black pepper as the final top. Bake in a 400 degree oven until the cheese is melted and golden color. The true way to cut this pizza is in squares…which I didn’t, and Dave questioned my true respect to this dish. No matter how you slice it – you’re going to love this pizza! Enjoy! This pizza turned out great, thanks for posting! You know... I've been dying to have a thin crust pizza! Thank you so much. That really made it easier for me to make!